After losing an hour of sleep, most of are still dragging, trying to adjust to the Spring ritual of Daylight Saving Time. HBO’s “Last Week Tonight” with host John Oliver gives us a brief history of the tradition, why it is bad for us and asks how is this still a thing? The changing of the clocks-which happened once again Sunday morning-is wasteful, unnecessary, and even dangerous. More recently, a study of homes in Indiana-a state that adopted Daylight Saving Time only in 2006-showed that the savings from electricity use were negated, and then some, by additional use of air conditioning and heat. The simple act of adjusting to the time change, however subtle, also has measurable consequences. Many people feel the effects of the “spring forward” for longer than a day; a study showed that Americans lose around 40 minutes of sleep on the Sunday night after the shift. This means more than just additional yawns on Monday: The resulting loss in productivity costs the economy an estimated $434 million a year. Daylight Saving Time may also hurt people who suffer from Seasonal Affective Disorder, depriving them of light in the mornings. “Our circadian rhythms were set eons ago to a rhythm that didn’t include daylight savings time, so the shift tends to throw people off a bit,” Nicholas Rummo, the director of the Center for Sleep Medicine at Northern Westchester Hospital in Mt. Kisco, New York, told HealthDay News. The switchover to Daylight Saving Time is also linked to an increase in heart attacks as well as traffic accidents. Six years ago, Paul Ryan, who has since become the chairman of the House Ways and Means Committee and the G.O.P.’s leading voice on matters economic, had an Op-Ed article published in The Times. Under the headline “Thirty Years Later, a Return to Stagflation,” he warned that the efforts of the Obama administration and the Federal Reserve to fight the effects of financial crisis would bring back the woes of the 1970s, with both inflation and unemployment high. True, not all Republicans agreed with his assessment. Many asserted that we were heading for Weimar-style hyperinflation instead. Needless to say, those warnings proved totally wrong. Soaring inflation never materialized. Job creation was sluggish at first, but more recently has accelerated dramatically. Far from seeing a rerun of that ’70s show, what we’re now looking at is an economy that in important respects resembles that of the 1990s. Robert Kuttner: Will the Fed Kill the Recovery Again? The Labor Department reported that the economy added 295,000 payroll jobs in February, the 12th straight month of job creation of better than 200,000 a month. And the Dow Jones Industrial Average promptly dropped by nearly 300 points. What gives? Do capitalists hate workers? Well, perhaps; but the immediate explanation is concern about the Federal Reserve. If unemployment keeps falling, the Fed is more likely to raise interest rates. And if the Fed raises rates, that’s bad for the stock market because bonds start to be a better investment than stocks; and the expectation of flat or declining stock prices feeds on itself and sets off a wave of stock selling. Supposedly, the assumption that the Fed will raise rates in the not too far distant future has been already “priced in” to share prices. But that’s malarkey. Markets react emotionally, not always rationally. American democracy has a secrecy problem. Part of the cure is the discovery and publication of excessive secrets – and, for this, we need a vibrant free press, including online investigative journalism sources and traditional newspapers. According to Alex Jones, the director of Harvard’s Shorenstein Center on the Media, a skilled investigative reporter can cost more than $250,000 a year for only a handful of stories. Even when a news organization is fed hidden information, the legwork required to check it can be extraordinarily expensive. Indeed, before the German newsmagazine Der Spiegel published information provided by WikiLeaks, it took a team of 50 nearly four months to analyze the American diplomatic cables and the so-called war logs took a team of 30 around two months. Policy intellectuals — eggheads presuming to instruct the mere mortals who actually run for office — are a blight on the republic. Like some invasive species, they infest present-day Washington, where their presence strangles common sense and has brought to the verge of extinction the simple ability to perceive reality. A benign appearance — well-dressed types testifying before Congress, pontificating in print and on TV, or even filling key positions in the executive branch — belies a malign impact. They are like Asian carp let loose in the Great Lakes. It all began innocently enough. Back in 1933, with the country in the throes of the Great Depression, President Franklin Delano Roosevelt first imported a handful of eager academics to join the ranks of his New Deal. An unprecedented economic crisis required some fresh thinking, FDR believed. Whether the contributions of this “Brains Trust” made a positive impact or served to retard economic recovery (or ended up being a wash) remains a subject for debate even today. At the very least, however, the arrival of Adolph Berle, Raymond Moley, Rexford Tugwell, and others elevated Washington’s bourbon-and-cigars social scene. As bona fide members of the intelligentsia, they possessed a sort of cachet. I have 3 articles for your perusal this morning. We all know male revolutionaries like Che Guevara, but history often tends to gloss over the contributions of female revolutionaries that have sacrificed their time, efforts, and lives to work towards burgeoning systems and ideologies. Despite misconceptions, there are tons of women that have participated in revolutions throughout history, with many of them playing crucial roles. They may come from different points on the political spectrum, with some armed with weapons and some armed with nothing but a pen, but all fought hard for something that they believed in. Let’s take a look at 10 of these female revolutionaries from all over the world that you probably won’t ever see plastered across a college student’s T-shirt. So why do I think that after Greece, Spain could be the next to experience a ballot box Revolution? The Gürtel investigation is going to trial. The suspects have been charged. The Popular Party as an organisation will now officially be tried, not as a suspect prosecuted for a crime but for being a “profit seeking participant” that benefited from the allegedly criminal fraudulent activities of its three former treasurers whose activities spanned a 20-year period, fundamentally the same period that the party has existed for, although the specific crimes 40 people have now been charged with took place between 1999 and 2005. Spain’s governing party will be ordered to repay €245,492. A quarter of a million euros. Ana Mato, who was Mr. Rajoy’s Health Minister until the end of November last year, will have to hand back €28,467. She famously claimed she did not know she had a brand new Jaguar parked in her garage at home. She is still a sitting MP. The Public Prosecutor is seeking 42 years in prison for Luis Bárcenas, the most well-known of the three former party treasurers, who was recently released from prison after 18 months on remand during the investigation. Those accused must post a total of €449 million in bonds to cover restitution liabilities. Half-a-billion euros. Spanish voters know there is nothing they can do about corruption until the elections, and then they cannot get rid of individual rotten apples because, as Mr. Rajoy is demonstrating, it is he who decides who will be the party boss in each Spanish region and major city, not voters, party members or even the senior regional leaderships themselves, who for weeks have been on edge over the Prime Minister’s decision. The freshly anointed chiefs will decide who gets on their coveted electoral lists, who is to be on their team with a chance of playing in the next round. Thus Spain races from one end of the political spectrum to the other, at the national and regional levels. There is no middling option seeking balance, no gentle pruning of dead or dying branches; a party reigns strong in a place for many years and then, apparently suddenly, is out of favour with the voters and out of office. The implosion of senior party leadership at different levels and the swirling undercurrents of corruption will make for a very exciting electoral year in 2015 if they all come together in time to anger Spanish voters enough for them to decide radical change is what is now needed, that the current lot just won’t do anymore, that this is it, their only chance in four years to do something about it. Whatever the outcome. The Gürtel case is an ongoing political corruption scandal in Spain, which implicates officers of the People’s Party (PP), Spain’s major right-wing party, some of which have been forced to resign or have been suspended. The case came to public attention in early 2009, but for the most part the suspects are still awaiting trial. Gürtel is one of the largest corruption scandals in recent Spanish history, and there are related scandals, such as the Barcenas case, which have received media attention in their own right. The investigative operation was given the name Gürtel in a cryptic reference to one of the principal suspects, Francisco Correa (Correa means belt in English, Gürtel in German). Correa is a businessman who cultivated links with PP officers. The Spanish police began to investigate his activities in 2007 after information was obtained from a whistle-blower regarding alleged corruption in the Madrid area. The accusations include bribery, money laundering and tax evasion, and implicate a circle of businessmen led by Correa and politicians from the People’s Party. The alleged illicit activities relate to party funding and the awarding of contracts by local/regional governments in Valencia, the Community of Madrid and elsewhere. It’s not that you can buy politicians, it’s that it’s so cheap. We’ll try to remain serene and calm, when Alabama gets the bomb. At the end of a historic case, the U.S. Supreme Court rules, with only one dissent, that the African slaves who seized control of the Amistad slave ship had been illegally forced into slavery, and thus are free under American law. The Amistad, also known as United States v. Libellants and Claimants of the Schooner Amistad, 40 U.S. (15 Pet.) 518 (1841), was a United States Supreme Court case resulting from the rebellion of slaves on board the Spanish schooner Amistad in 1839. It was an unusual “freedom suit“, as it involved international issues and parties, as well as United States law. The rebellion broke out when the schooner, traveling along the coast of Cuba, was taken over by a group of captives who had earlier been kidnapped in Africa and sold into slavery. 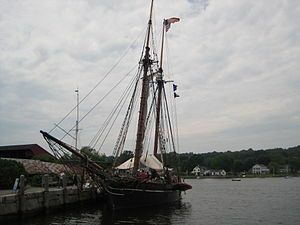 The Africans were later apprehended on the vessel near Long Island, New York, by the United States Revenue Cutter Service and taken into custody. The ensuing, widely publicized court cases in the United States helped the abolitionist movement. In 1840, a federal trial court found that the initial transport of the Africans across the Atlantic (which did not involve the Amistad) had been illegal, because the international slave trade had been abolished, and the captives were thus not legally slaves but free. Given that they were illegally confined, the Africans were entitled to take whatever legal measures necessary to secure their freedom, including the use of force. After the US Supreme Court affirmed this finding on March 9, 1841, supporters arranged transportation for the Africans back to Africa in 1842. The case influenced numerous succeeding laws in the United States. On February 23, 1841, Attorney General Henry D. Gilpin began the oral argument phase before the Supreme Court. Gilpin first entered into evidence the papers of La Amistad which stated that the Africans were Spanish property. The documents being in order, Gilpin argued that the Court had no authority to rule against their validity. Gilpin contended that if the Africans were slaves (as evidenced by the documents), then they must be returned to their rightful owner, in this case, the Spanish government. Gilpin’s argument lasted two hours. John Quincy Adams, former President of the United States and at that time a U.S. Representative from Massachusetts, had agreed to argue for the Africans, but when it was time for him to argue, felt ill-prepared. Roger Sherman Baldwin, who had already represented the captives in the lower cases, opened in his place. Baldwin, a prominent attorney (who was no relation to Justice Baldwin, the lone dissenter on the Court) contended that the Spanish government was attempting to manipulate the Court to return “fugitives”. In actuality, Baldwin argued, the Spanish government sought the return of slaves, who had been freed by the District Court, a fact that the Spanish government was not appealing. Covering all the facts of the case, Baldwin spoke for four hours over the course of the 22nd and the 23rd. John Quincy Adams rose to speak on February 24. First, he reminded the court that it was a part of the judicial branch, and not part of the executive. Adams introduced correspondence between the Spanish government and the Secretary of State, criticizing President Martin van Buren for his assumption of unconstitutional powers in the case. This review of all the proceedings of the Executive I have made with utmost pain, because it was necessary to bring it fully before your Honors, to show that the course of that department had been dictated, throughout, not by justice but by sympathy – and a sympathy the most partial and injust. And this sympathy prevailed to such a degree, among all the persons concerned in this business, as to have perverted their minds with regard to all the most sacred principles of law and right, on which the liberties of the United States are founded; and a course was pursued, from the beginning to the end, which was not only an outrage upon the persons whose lives and liberties were at stake, but hostile to the power and independence of the judiciary itself. Adams argued that neither Pinckney’s Treaty nor the Adams-Onis Treaty were applicable to the case. Article IX of Pinckney’s Treaty referred only to property, and did not apply to people. As to The Antelope decision (10 Wheat. 124), which recognized “that possession on board of a vessel was evidence of property”, Adams said that did not apply either, since the precedent there was established prior to the prohibition of the foreign slave trade in the United States. Adams concluded after eight and one-half hours of speaking on March 1 (the Court had taken a recess following the death of Associate Justice Barbour). Attorney General Gilpin concluded oral argument with a three-hour rebuttal on March 2. The Court retired to consider the case. On March 9, Associate Justice Joseph Story delivered the Court’s decision. Article IX of Pinckney’s Treaty was ruled off topic since the Africans in question were never legal property. They were not criminals, as the U.S. Attorney’s Office argued, but rather “unlawfully kidnapped, and forcibly and wrongfully carried on board a certain vessel”. The documents submitted by Attorney General Gilpin were not evidence of property, but rather of fraud on the part of the Spanish government. Lt. Gedney and the USS Washington were to be awarded salvage from the vessel for having performed “a highly meritorious and useful service to the proprietors of the ship and cargo”. When La Amistad came into Long Island, however, the Court believed it to be in the possession of the Africans on board, who had no intent to become slaves. Therefore, the Adams-Onis Treaty did not apply, and the President was not required to return the slaves to Africa. Upon the whole, our opinion is, that the decree of the circuit court, affirming that of the district court, ought to be affirmed, except so far as it directs the negroes to be delivered to the president, to be transported to Africa, in pursuance of the act of the 3rd of March 1819; and as to this, it ought to be reversed: and that the said negroes be declared to be free, and be dismissed from the custody of the court, and go without delay. Sunday Train: On Amtrak, I’ve got some good news, and some bad news. This last week, there was the surprising start to a headline in the Washington Post that began, “GOP House and White House agree on something” … and that something was: Amtrak funding (and pets on a train). But its not all good news this week … because if the INDOT has its way, the Hoosier State will be cancelled.